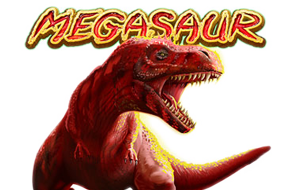 Megasaur – Wilds, Free Spins, Win-Win Feature, Progressive Jackpot and the Feature Guarantee. 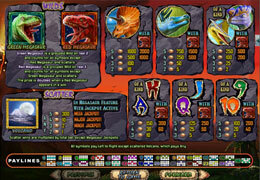 Megasaur is set deep in the jungle where players are surrounded by Dinosaurs. The dramatic background goes back to prehistoric days when Dinosaurs roamed the Earth. Red and Green Megasaur, 4 other Dinosaurs, Volcano and the Ace to 10 playing card symbols. The Green Megasaur Wild landing on Reel 2 substitutes for all symbols except for the Wild Red Megasaur and Volcano symbols. The Red Megasaur landing on Reel 4 substitutes for all symbols except the Green Megasaur and Volcano symbols. 2 or more Scatter symbols award a cash prize ranging from 1 to 300 times the bet. During the bonus round there is the chance to win a progressive jackpot by collecting enough Scatter symbols on a single spin. Click on each Scatter to reveal the free spins 2, 5 or 10 which get added together giving the total number of free spins. Players are guaranteed at least 6 free spins, with the maximum of 50 when landing 5 Scatter symbols, and maybe find 10 free spins behind each symbol! This feature helps to reward players who don’t get lucky in the free spins mode. Zero wins during the free spins will credit 250x the initial bet. The Megasaur slot features one of the largest progressive jackpots available online with more than $1,000,000 up for grabs! The jackpot can only be won during the free games feature. During the free games get 3 or more Volcano symbols to win some or the entire progressive jackpot amount. The amount depends on how much was bet and how many Volcano symbols appear on a single spin. 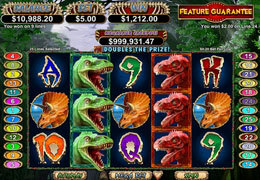 Bet the maximum of 5.00 per spin to win 10%, 20% or 100% of the progressive jackpot by landing 3, 4, or 5 Volcano symbols respectively. This is a fantastic game with added paylines, stacked symbols, game features and the progressive jackpot!